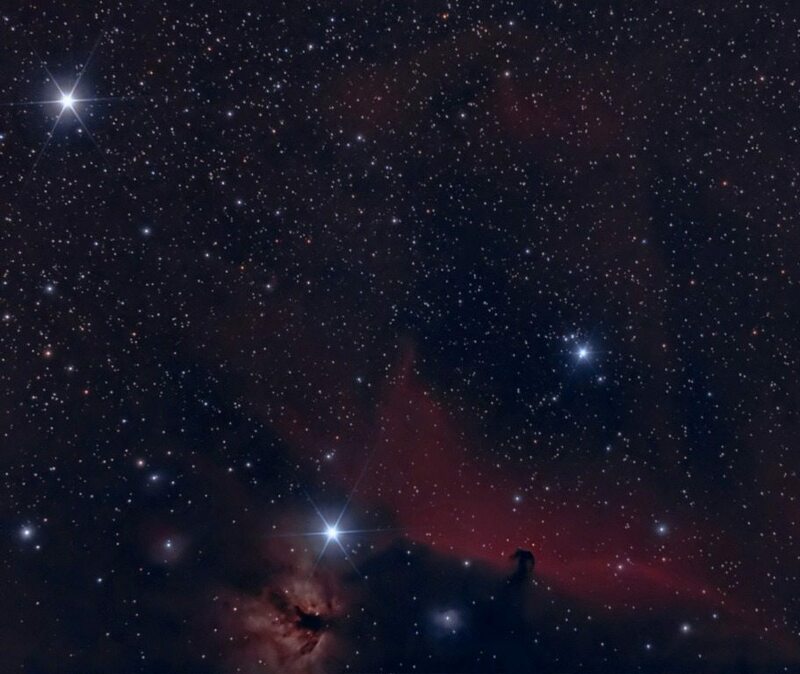 What could be more awesome than a deep sky image? Flickr: A panorama in Orion. 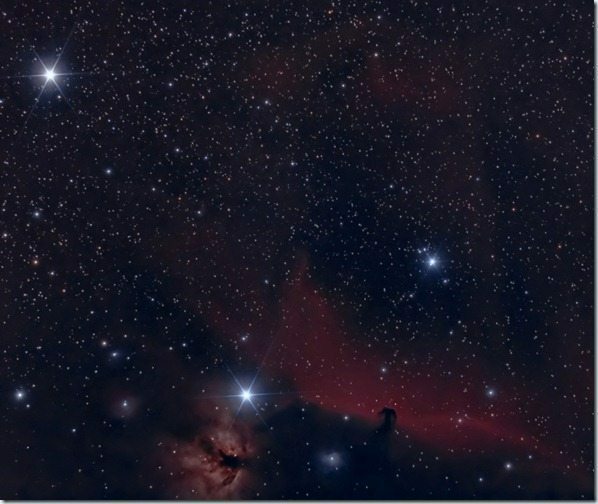 The Horsehead and Flame Nebula on the left and “Great Nebula” on the right. The above image was captured in one night from under urban, light polluted skies during an exceptionally clear evening. It was a frosty and chilly night and the air was still, making very good conditions for astronomical observation and imaging. This is my first attempt at a mosaic, it’s made from two pictures sewn together in Photoshop (two layers blended together around the middle). I’ve over-processed the Great Nebula and lost some of its detail. It can be fixed later. 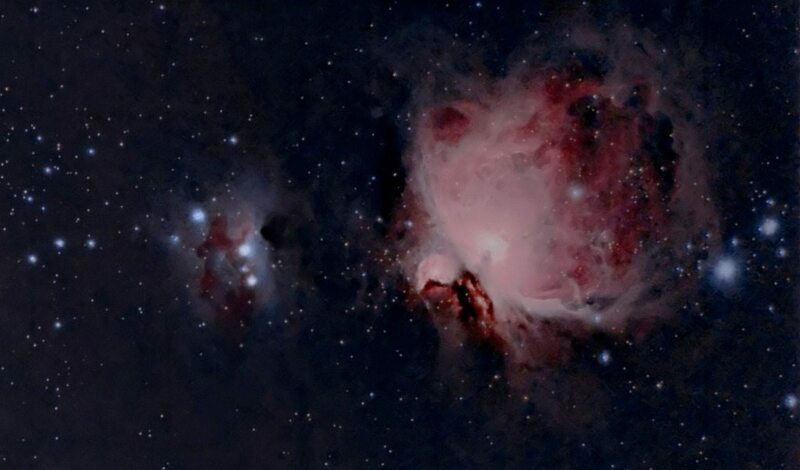 A close-up of The Great Nebula in Orion (taken from the panorama). (I’m not happy with how this came out). The Great Nebula in Orion is a cloud of energised gas and dust that is condensing – in parts – in on itself. When a ball of sufficient mass and pressure has built up to a critical level, atomic fusion occurs and the ball of dust and gas becomes a great ball of fire. The ball of fire we call a ‘star’ (which is the same as a ‘sun’) and it is these young hot stars that are blowing away the surrounding gas and dust and that’s how the Great Nebula gets it’s blown-out shape. Once ‘born’, the stars don’t stay in the nebula for long. They move out and away to live out their lives. When the bigger stars die, they explode and their matter is what makes everything else in the universe that isn’t hydrogen or helium. All that solid stuff you see around you (including you!) was made from particles forged inside a very large sun (much bigger than ours) and thrown out into the cosmos way before even our sun was formed. It’s amazing that we can know all this, through the scientific method.